Your opportunity to join a growing network of passionate, emerging professionals, and win your ticket to DIA Europe! After the success of Leader of Tomorrow at DIA Europe 2018 in Basel, the "LoT" programme returns to Vienna in 2019! The Leader of Tomorrow programme is dedicated to all emerging professionals and students willing to get out of their comfort zone and daily routine. Students and emerging professionals are invited to join as paying attendees (criteria and registration details below) or enhance their experience by participating in the Leader of Tomorrow Challenge with the chance to win a free registration for the conference. Your opportunity to earn complimentary access to the full DIA Europe 2019 programme. Leader of Tomorrow is an inclusive community for emerging professionals and students. It’s the perfect platform to receive and offer advice, to be inspired and to inspire others. To download the App, click the relevant button below or search for "DIAGlobal" in the App Store or Google Play. Once downloaded, select the “Leader of Tomorrow” event to join. Compete in the "Leader of Tomorrow" challenge to demonstrate your commitment to advancing your career and engaging with fellow leaders. Challenge activation and leader board standings will all take place in the DIA Global Mobile App. The challenges will start on 1st September 2018. Be ready! Deadline to submit the challenges is 10th December 2018, 4:00 pm. Top 10 Challenge Winners will be announced on 14th December 2018. 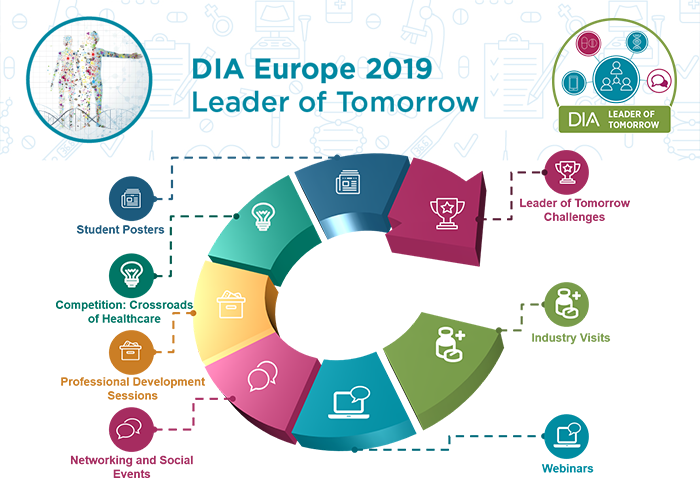 Top 10 Challenge Winners will receive complimentary registration to DIA Europe 2019. If winners are unable to attend, we can accommodate free registration to DIA Europe 2020. Registered Emerging Professionals and Students will benefit from the entire DIA Europe 2019 programme, in addition to specialty sessions specifically tailored to address their professional goals. Attendance for Leader of Tomorrow sessions is mandatory for the participants registered with the lowered fees (students, respectively emerging professionals). Professionals working in health product development, regulation and related fields, under the age of 32. 2. Please submit a scanned copy of A- this Registration Form, B- your photographic ID and C- a copy of your CV at Basel.Young.Professionals@DIAglobal.org. Applications will not be considered without a copy of photographic ID (e.g. passport, driving license) or a CV. Photographic ID is necessary to confirm age requirements. Copies will remain confidential and will not be used for any other purposes. You are welcome to distort any other portions of document, such as identification numbers. Attendance for Leader of Tomorrow sessions is mandatory for the participants registered with the "Emerging Professionals" fee. More information about the dedicated programme will follow soon. Undergraduate, graduate or PHD students (under the age of 32) who can demonstrate that they are enrolled in a full-time degree or certificate granting, academic programme in a recognised academic institution, or individuals currently conducting a full-time internship at the time of registration and start of the meeting. 2. Please provide A- this Registration Form and B- your photographic ID and C-proof of eligibility together with your registration, i.e. letter of enrolment from the university and/or department/ copy of your student card at Basel.Young.Professionals@DIAglobal.org. Applications will not be considered without a copy of photographic ID (e.g. passport, driving license) and the letter of enrolment/copy of the student card. Photographic ID is necessary to confirm age requirements. Copies will remain confidential and will not be used for any other purposes. You are welcome to distort any other portions of document, such as identification numbers. Attendance for Leader of Tomorrow sessions is mandatory for the participants registered with the Student fee. Please contact Basel.Young.Professionals@DIAglobal.org with any questions.